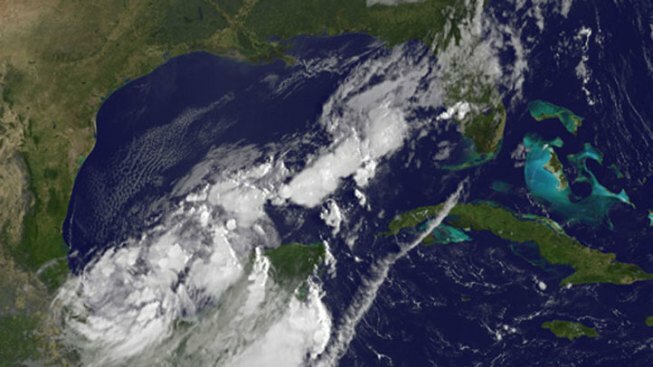 This image provided by NASA Wednesday shows Tropical Storm Nate forming in the Gulf of Mexico. Tropical Storm Nate has formed in the Gulf of Mexico, and authorities have issued a tropical storm warning for parts of Mexico's coast. The U.S. National Hurricane Center in Miami says Nate could become a hurricane by Friday. The storm was nearly stationary Wednesday night, moving east at about 2 mph (4 kph). Nate is expected to move very little Wednesday and Thursday, and then it will start to move north by Friday. Nate's maximum sustained winds were at 45 mph (72 kph) Wednesday. Unfortunately, NBC 5 Chief Meteorologist David Finfrock said Wednesday that we shouldn't hold out hope that Nate will bring much needed to rain to North Texas. Meanwhile, Tropical Storm Maria was swirling in the western Atlantic. It was still far from land and was not expected to strengthen in the next couple of days.